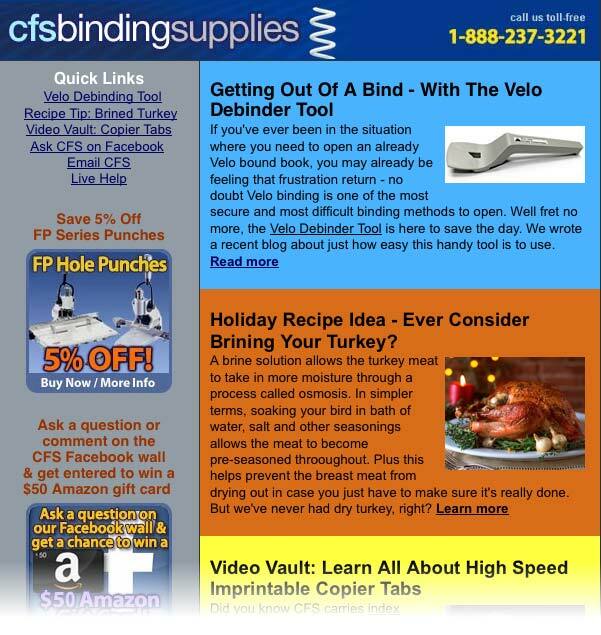 In Mid-November 2012’s newsletter: ‘Unbinding’ a velo bound document can often times prove to be frustrating and very difficult – that’s where the handy Velo Debinder Tool comes in to save the day. Brined turkey recipes also show up in this newsletter – marinating your bird in a brine adds flavor throughout and increases moistness. In the Video Vault – we reach back to a video that shows everything there is to know about High Speed Copier Tabs. ← Question Corner: Is There An Easy Way To Remove Velo Binding Strips?